One of the signs that we are in the last days before Jesus returns is a proliferation of false teachers promoting false doctrines (Matt. 24:24; Mk. 13:22). One of these deceptions the elect have naively embraced is the eastern occultic practice of Yoga. Church calendars are filled with yoga classes teaching what is considered a harmless "Christianized" version of yoga stretches. If they only knew how occultic — how demonic — the purposes of yoga truly are. Even the "harmless" exercise portion are in reality various ritual genuflects to Hindu idols. Jeremy (J.R.) Hall, Executive Director of Berean Watchmen Ministries located way up there in Saskatoon, Saskatchewan in Canada, has written an excellent article titled A Stretch into the Occult: A Christian's Response to Yoga that delves deep into the occultic practices and demonic purposes of yoga. Jeremy has kindly allowed me to repurpose his article in the hopes that we can warn Christians away from this satanic deception. Due to the length of the article, it has been divided it into three parts: the last part was on the satanic deception behind yoga, this second part is on how yoga and Hinduism are one and the same, and the final installment lists the reasons why yoga is definitely not for Christians. Hinduism encompasses a wide variety of religious beliefs, and has been influential in the foundations of other religions, such as Buddhism and the New Age Movement and spin-off religions. Hindus are very tolerant of other religions, because they believe that all paths eventually lead to God — because ALL is God. The Law of Karma is a guiding principal of Hinduism and is the law of cause and effect, in which each individual creates his own destiny through his thoughts, words and deeds. If we do a good deed, then we will in turn receive positive consequences or blessings. Bad actions or deeds will have the opposite effect. Essentially it is the old adage, "What goes around, comes around". Often the Law of Karma isn't accounted for in this life, but it impacts your future life. It traps individuals in a cycle of reincarnation, each successive life better or worse dependent on your karmic performance of the previous life. Those who built up bad karma may be born into a lower caste (class) or even as an animal or an insect. It may take many more lifetimes of suffering before they are again born as humans. Selfless acts and thoughts as well as devotions to the Hindu god(s) help one to be reborn at a higher level. The process of successive reincarnated lifetimes is called transmigration. Transmigration is passing of the soul at death into a new body or new form of being. Transmigration and reincarnation (the soul's rebirth in a new body) are roughly the same. Transmigration occurs until a soul reaches the perfect state of nirvana, or one with god. Nirvana is the supreme state free from suffering and individual existence. It is a state often referred to as "self realization" or "god realization". It's the ultimate religious goal of all Hindus. The attainment of Nirvana breaks the otherwise endless rebirth cycle of transmigration. Hindus call this nirvana "eternal bliss". However, no one can describe in words what nirvana is. It can only be experienced directly. Hinduism is monotheistic — sort of. It recognizes one supreme deity known as Brahman, or ultimate reality. Brahman is the universe and all it contains. Essentially, god is everything, and everything is god, a belief that is known as pantheism. To take the concept further — If "everything" is god, then that would include you and me. Unlike Christianity, Hinduism has no concept of a personal and knowable God, who is separate from his creation. To a Hindu, Brahman is simply all that exists. To really confuse the issue, Hinduism also has a polytheistic side. It includes aspects of worship of multiple deities (although they are all considered manifestations of the one ultimate reality). Brahman is personalized as three separate entities: Brahma (the Creator), Vishnu (the Preserver), and Shiva (the Destroyer). Most Hindus also worship Krishna and Rama, two of Vishnu's ten incarnations, or avatars. In addition to these major gods (incarnations of Brahman), forces of nature, animals, and humans can all be deified, giving Hindus a pantheon of 330 million gods and goddesses to worship. Not the Jesus of the Bible. Not the true Jesus. Hindus are very happy to consider Jesus to be ONE of the many avatars or incarnations of the impersonal Brahman, however, they do not accept Christ as the ONLY incarnation of God. In no sense does Hinduism recognize Jesus as the unique Son of God, Co-equal, Co-eternal and Co-reigning within the Triune Godhead of the Bible. There is no concept of Sin against a Holy God in Hinduism. To a Hindu, man's biggest problem is his ignorance that he is in fact "god" himself. In Hinduism, since Brahman is all that exists, everything else is ultimately an illusion. Our material world, physical bodies, and our personal existence are all illusions. In essence our ignorance in Hinduism is equivalent to the "fall of man". We have forgotten that we are part of Brahman, and have attached ourselves to the desires of individual self. It is these desires and their consequences that bring suffering, and that subject us to the Law of Karma. Although there is no concept of "salvation", the goal is to remove the karmic debt and end the cycle of rebirths. When one overcomes their ignorance of their own divinity and a detachment from self (an illusion), the individual can be released from personal existence and disappear into the impersonal Brahman. This 'liberation' from the wheel of life is called moksha or nirvana as we mentioned before. Freed from their physical, personal existence, individuals also become free from all pain and suffering, and become like a single star within all the universe that is Brahman. There are three paths to achieve this liberation from the wheel of life. Liberation can be obtained through social and religious obligations. This is the most popular way, and includes acts of worship to any of the numerous gods and/or avatars. Whether in a home or in a temple, worship is primarily done individually rather than as a congregation. Most Hindus worship daily through offerings, rituals, and prayers. Prayer or worship is considered to be an integral part of the Hindu way of living. The chanting of mantras is the most popular form of worship in Hinduism. This way attempts to reach a higher consciousness until one finally realizes his identity (or lack of identity) within Brahman. This is achieved through study of philosophical writings, yoga and deep meditation. As just mentioned, yoga is one of the "Ways of Knowledge". Yoga is one of the classic systems of Hindu philosophy that practices certain disciplines to achieve freedom from the limitations of the flesh and lead to the fulfillment of knowledge. The goal of yoga is not to achieve peace within, channeling, or the working of miracles, but the acquirement of knowledge. In fact, the yoga doctrine insists that physical and mental training should be used only as a means to spiritual needs. Yoga practice forms a ladder to perfect knowledge through eight stages: self-control, religious observance, postures, regulation of the breath, restraint of the senses, steadying of the mind, meditation, and profound contemplation. The philosophy and practice of yoga have been primary tools of Hindu missionaries to North America since Indian priest and mystic Swami Vivekananda introduced yoga to the West at the World's Fair in 1893 in Chicago. 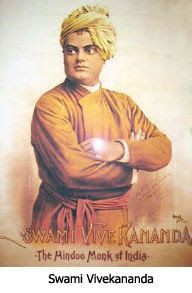 Swami Vivekananda is attributed with the idea of combining the theory of "evolution of the soul" with his teachings of Hinduism. Instead of working out one's karma by becoming a grasshopper, lizard or human in progressive lives, he taught an "evolution of the soul" whereby the individual continues in an evolutionary process to "manifest the god within" — from slime to divine. This new brand of Hinduism was undoubtedly born because it was thought that North American's would not buy into the traditional Hindu concepts of reincarnation. It would seem that pride has always plagued us North Americans. Not many westerners could imagine they would ever come back as a lower form of life. Another fellow of interest is Paramahansa Yogananda. Another Hindu missionary, this time in 1920 he was welcomed warmly by elite circles of that day. He started the Self-Realization Fellowship in Los Angeles which still exists today. He chose to demonstrate that yoga was completely compatible with Christianity. Wearing a cross, he came to America with a Hindu religious text, the Bhagavad Gita, in one hand and the Bible in the other. He reasoned that yoga was the binding force that could connect all religions together. He wrote a book titled, "The Second Coming of Christ: The Resurrection of the Christ Within You". 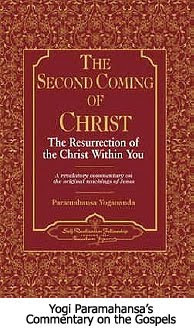 Essentially it was Yogi Paramahansa's commentary on the four Gospels, or as the cover of the book reads, "A Revolutionary commentary on the original teachings of Jesus." Now let's stop right there. Right now for any evangelical Christian who seeks truly after the heart and mind of God, warning bells should be ringing loudly in our heads. What on earth would a Hindu guru have to reveal about the teachings of Jesus. Was it not Jude who warned us to keep to the original faith? Take careful note of Jude's words, "was once for all". The implications of these words are that the canon is closed. There is no special revelation beyond those that the bore the approval of the apostles. Any teaching, new or old, must align itself perfectly with Scripture, or that teaching is deemed false. God is not the author of confusion. He invented language and wanted us to understand His Word as delivered. How unfortunate it is that the modern Church does not recognize this most essential fact. In the next part we will look at the reasons why yoga is definitely not for Christians. i had a friend (lots of em actually) who talk about karma alot. one day i decided to challenge them on it. i said: if karma really exists then why should we help all those victims from hurricane katrina? after all "what goes around comes around" so they must have done something really bad. and what about all those earthquake victims? karma teaches us to help people but if people need help to begin with then they did something bad so we shouldnt help them. KARMA CONTRADICTS ITSELF! if the other religions teach karma then there are glaring inconsistencies so they`re obviously wrong. that shut them up and made them think. i have a friend who starts community college next week. he went to a christian school his whole life so he`s a little sheltered. he has been thru a little bit of stuff tho. pray his faith will remain strong. he`s a good friend of mine and i`d hate to see some liberal try and destroy his faith. i think he`ll be fine tho but still pray. Excellent articles, Nathan. I pray they find their way to those who need to read them. My most Revered Guru of my previous life His Holiness Maharaj Sahab, 3rd Spiritual Head of Radhasoami Faith had revealed this secret to me during trance like state. Since I don’t have any direct realization of it so I can not claim the extent of its correctness. But it seems to be correct. During my previous birth I wanted to sing the song of ‘Infinite’ but I could not do so then since I had to leave the mortal frame at a very early age. But through the unbounded Grace and Mercy of my most Revered Guru that desire of my past birth is being fulfilled now. Junbuggg, have you ever read Frank Peretti's "Piercing the Darkness"? If not, do it. Not only is it an excellent book, but it explains much of this in story form. When a person empties themselves through trances and yoga they are open to demonic deceptions like being dead priests and whatnot. This person was obviously in a state of "openness" and his "spirit-guide" told him some stories. Sorry, but this article has errors in it. Nirvana is a BUDDHIST term...not Hindu. That is first of all. The state that people try to attain is called Samadhi..this is a state of PERFECT BLISS..and whether you want to believe it or not, this is the state that JESUS was in all the days of his life...every minute. Secondly...Regardless if you think that Hinduism is polytheistic, it is MONOTHEISTIC...never will a real teacher say there is more than one God...there are simply different aspects of ONE God...How can there EVER be more than one god? Think of it this way...compare it to humanity...there is only one human race, right? Well, just as there is only one human race, there is only one God...are all humans the same? No...we all have different talents and personalities..just like the different "Gods" in Hinduism...do you call on an engineer to fix your plumbing? No..you call on the plumber who specializes with the pipes...it is he same with the Gods..you call on the particular God who "specializes"in your need...would you ever say that there is more than one human race? no..it is the same with the gods. You also state there is no concept of salvation...NOT TRUE. The concept of moksha, is the equivalent to your concept of salvation...it is the freeing of the cycle of death and birth and happens at death..it is the same as your concept of "heaven" after death...This "salvation" also can happen while you are still in a body, which is much more rare, in which case you are COMPLETELY ONE with God while you are alive...and when that happens you also have "salvation" from the cycle of birth and death...and then you are called a jivan mukti. The last things that is so completely disturbing about your article is that you say there is no concept of charity..who on earth told you this? This is COMPLETELY FALSE...every real teacher of Hinduism will say that selfless service, or volunteering to assist suffering humanity, is ABSOLUTELY CRUCIAL in your spiritual life, and that you cannot make real progress without doing so. In fact, the more someone is suffering, or the more that one has "bad karma" as you say, the MORE HINDUS. ARE TAUGHT TO HELP THEM. Did you know that if you are hungry and you need food, you can walk up to ANY HINDU HOME in India and Nepal and those people will treat you like GOD..foregoing their own tiny bit of food in order to feed you? Where in the west have you ever seen someone do that? Your ideas of charity contained here are completely wrong. I hope next time you will do a little more research before making blanket statements about spiritual concepts you are not entirely familiar with.